The first time I made scones was a disaster. It was years ago and they were inedible. They were dry as a bone, crumbling into a hundred pieces. Looking back at the recipe, I realized there was no liquid in it and that surely must have been the problem. Now, I have moved on this to this great recipe and thankfully they are moist and hold their shape. 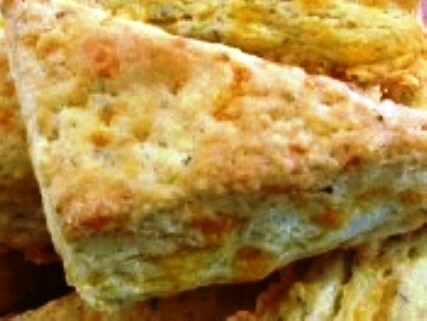 The scone is a small British quick bread that is popular in North America also and can be sweet or savory. The early recipes were made with oats, prepared into a large round cake and baked on a cast iron griddle in an open hearth. To make it easily divide into portions, they were deeply scored before being baked. A scone is a wonderful thing: buttery, soft yet firm with being very easy to make. They are a lot like biscuits but do tend to get hard once they are cold, probably because the dough is on the dry side. That’s OK though; just dunk them in a cup of coffee or tea! This scone recipe includes lots of cheddar cheese, butter and chives. 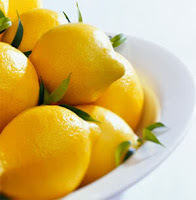 I think maybe even a little lemon zest would give them great additional flavor. One taste of these will tell you just how delicious they are! In a large bowl, combine flour, sugar, baking powder, salt and pepper. Cut in the butter with a pastry blender until mixture becomes like coarse crumbs. Stir in 2/3 cup cream. Add cheese and chives and combine with hands, dough will be crumbly. Knead dough until it comes together. Form into a ball and flatten slightly to 1” thick. Slice into quarters and then cut each quarter in half. Brush tops with remaining cream. This is a recipe of Mom’s; it’s moist, buttery and filled with plenty of good things! 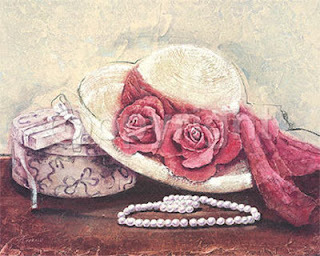 She added 1 cup of sugar, I add ¾ cup; she had a great sweet tooth and loved her sweets. It also combines sour cream and chopped nuts, with a nice flavorful streusel on top. 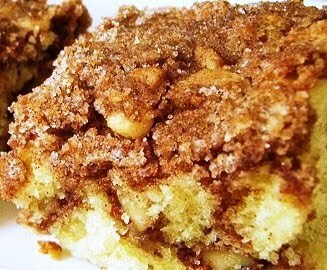 This coffee cake is very good and quite easy to make; quick like she says! Mix it together; pop it in the oven and Voila! You are ready to enjoy it hot out of the oven, warm or room temperature. And it even freezes well if you care to do so. I like it right out of the oven myself! So get to baking your coffee cake and brew up your coffee! Add sour cream and baking soda. Stir. Sift flour with baking powder, add to mixture, stirring well. Combine ingredients for streusel, reserving 1/3 cup for top. Grease 8” x 8” baking dish. Pour half of mixture in pan. Sprinkle with nut and cinnamon streusel mixture. Bake at 350 degrees for 45 minutes or until toothpick tests clean. I’m off to enjoy my big slice of coffee cake right now! Here’s wishing you a wonderful Sunday! 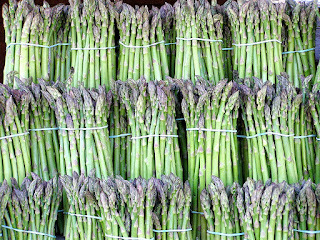 Don’t you just love fresh asparagus in the springtime? We do and have it often. 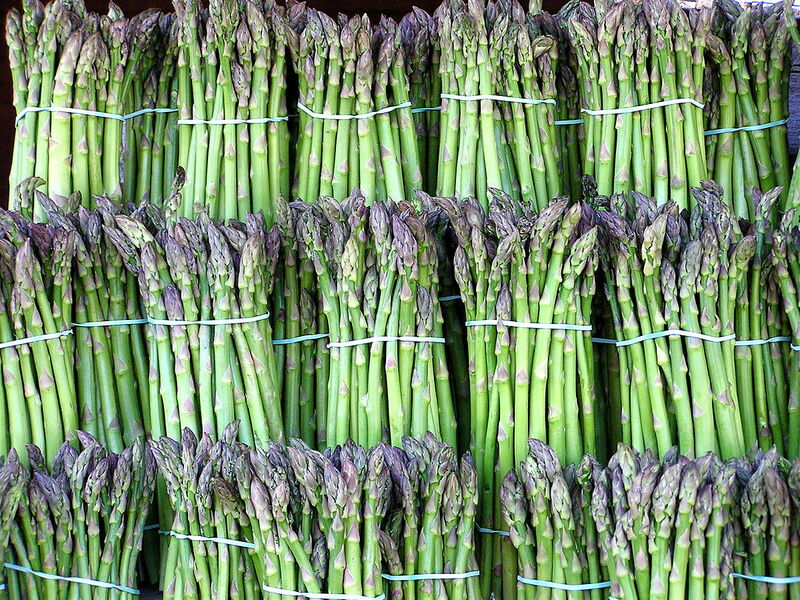 I had usually eaten steamed asparagus but, when I met Bill, I learned there is another delicious way to enjoy it. I lived in Louisville, met Bill and came up here to Crystal Lake to meet his family. 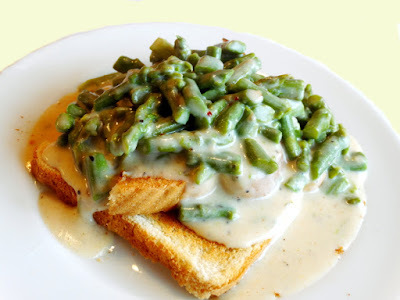 One of the meals Alice (his mother) prepared was fresh caught blue gills with creamed asparagus on toast. I remember that meal like it was yesterday. I’m sure my future mother-in-law thought I was eating like it was my last supper! I love blue gills and what could be better than fresh ones? Herb, Bill’s father, was a great fisherman and caught many varieties of fish. In fact, after we moved here in 1980, we bought a house in a subdivision with a lake for fishing. My father-in-law stored his boat there and especially after he retired, we would find him out on the lake many a day ~ we thoroughly enjoyed his bounty! Unfortunately, they changed the lake rules to a “fish and release” program several years ago, so that is the end of that. But, while my father-in-law was living, I was thrilled that it provided many a good day of enjoyment for him! Back to that great dinner: what really got my mouth watering besides the fresh blue gills was her creamed asparagus with that great buttery sauce spooned over toast. Oh my gosh! If you love asparagus and have never eaten creamed asparagus on toast, you are in for a mouthwatering experience! Prepare and simmer asparagus for about 10 minutes, just until tender. Drain well, reserving the broth. Slowly add milk, salt, pepper and broth. Add additional water if the sauce is too thick. Heat just to boiling, avoid mashing the asparagus. Pour the mixture over the asparagus and gently combine. Meanwhile, toast several slices of bread and slice in half diagonally. Spoon creamed asparagus into a bowl. It is Oh My Gosh, DELICIOUS!!! Kathryn was a cousin of Mom’s, Ez’s daughter. She probably died before I was even born; however, I heard Mom talk about her many times ~ what a great cook and baker she was. Mom learned a lot about cooking from Kathryn and prepared many of her recipes, including this cake. I do remember Ez Courtright though. He was a small bald man with a moustache, wore glasses and smoked cigars. What I remember most about him was his laugh. I can hear him now with his soft deep laugh and he was always jovial with something funny to say. And he adored his grandchildren! To tell you how old this recipe is, it includes Spry as an ingredient. Do you remember Spry? It’s a vegetable shortening first produced in 1936. It lost its appeal in the early 1950’s because mainly of Crisco. As I remember it, it was very yellow but, I’m not sure about that. 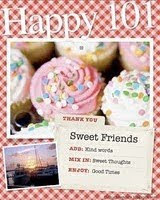 Spry’s mascot was Aunt Jenny with her saying, “We can afford to have cake oftener. 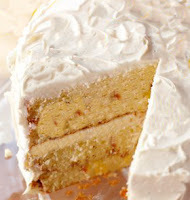 It seems we seldom hear of orange cakes anymore but, if you love oranges, this is the cake for you! 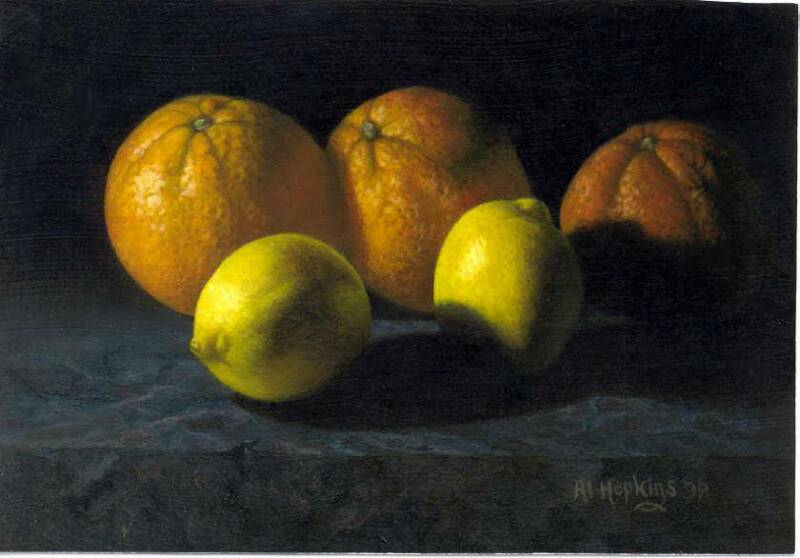 It’s moist and delicious with a delicate citrusy taste thanks to the orange juice and grated rind. Plus, it’s very fragrant! 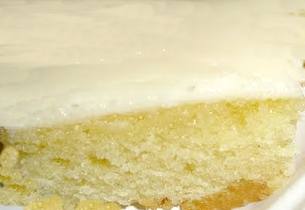 It’s light and refreshing and a great cake for springtime. How about your dessert at your Easter dinner table? Grease and flour two cake pans. Combine Spry, salt and grated rind. 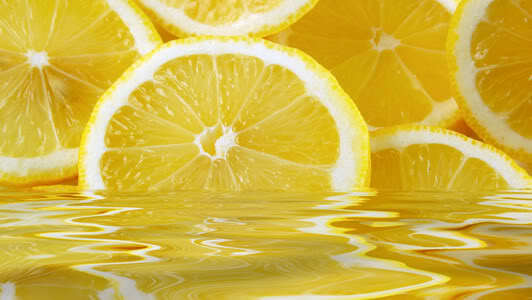 Add enough water to orange juice and lemon juice to make 1 cup. Alternately, add flour and juice mixture, beating after each addition. Bake at 350 degrees for about 30 minutes until top is golden and when toothpick inserted in center comes out clean. Cool in pans on wire rack for 10 minutes. Combine all ingredients, except powdered sugar and cream well. Place one layer on cake plate and spread icing. It’s a perfect dessert or snack! Midwest Living magazine published a wonderful recipe for chocolate chip cookies and I would like to share it with you. These cookies are made at Lindsay’s Chocolate Café and Coffee House in O’Fallon, Missouri, in the St. Louis area. I will definitely be visiting this café the next time I am headed that way! The cookies have a “flavor-packed lineup” of ingredients that make for a great treat. They are filled with rolled oats, grated milk chocolate, semi-sweet chocolate pieces and nuts to make each bite delectable. The double chocolate adds color and flavor and the oats and nuts add a great chewy texture. The unique thing about this recipe is that the cookies can be baked on a preheated stone as well as cookie sheets. The article states that the baking stone makes slightly crisper edges. I have never heard of cookies being baked on a baking stone. Are you familiar with that? Add sugars; beat on medium speed until mixture is combined, scraping sides of bowl occasionally. Beat in as much of the flour mixture as you can with the mixer. Stir in any remaining flour mixture with a wooden spoon until combined. Stir in chocolate pieces, nuts and grated chocolate. Drop dough from a large cookie scoop (3 tablespoons) 4 inches apart onto ungreased cookie sheets or a preheated baking stone. Bake in a 375 degree oven for 9 to 10 minutes or until edges are light brown. Cool on cookie sheets or baking stone for 1 minute. This cookie is a star! My cousin, Vicki, commented a while back on my round steak post about how much she loves it, and when her Mom asked her what she wanted for her birthday dinner, she always requested round steak. I know what she means, as that's the way it is for me with bean soup and cornbread. This would be a perfect dinner to me anytime, even on my birthday. I am guessing most people don't love it that much. When I was growing up, I could count on every Saturday night Grandma cooking bean soup and corn bread or sometimes it would be with dumplings and always a large glass of ice tea. Those were the good old days, for sure! 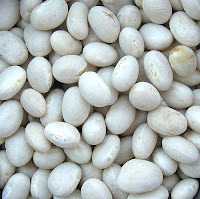 Most people like bean soup in a bowl best, but not me ~ I place a slice of bread on my plate, slather it with butter, load it up with bean soup and top it with a blob of ketchup. Yum!!! If I bake cornbread, that works just as well. 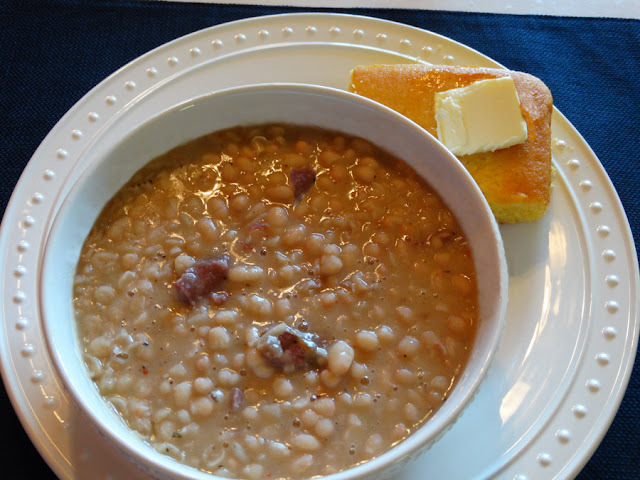 Just basic thick bean soup, no frills, except for maybe a ham bone! Add to dutch oven or a suitable pot. Add ham, onion salt and pepper to taste. Lower heat, cover and simmer for 1 ½ hours or until done. With the back of a wooden spoon, mash some beans against the side of the pan to thicken the soup, if needed. This is so simple but an absolute favorite of mine! Yum!!! Yum!!! Hasselback potatoes are baked potatoes kicked up a notch. They are named after the Restaurant Hasselbacken that first served them in the late 1700’s in Stockholm, Sweden. They're known throughout European cuisine with the Irish calling them Accordion Potatoes. It makes sense to me because that is what they look like. They are a fun potato to make and delicious to eat! These potatoes look like they might take a long time to prepare but that is not the case. I found that the easiest way to cut them is to place chopsticks, or wooden spoon handles, on both sides of the potato, hold it firmly and start slicing every ¼” from the top down to the spoon handles. It’s very easy and a sure way not to accidentally cut through the whole potato. When properly made, the potato should have opened up like the folds of an accordion into a fan shape. They are delicious and have a great presentation to add some dazzle to an ordinary meal or a holiday meal. 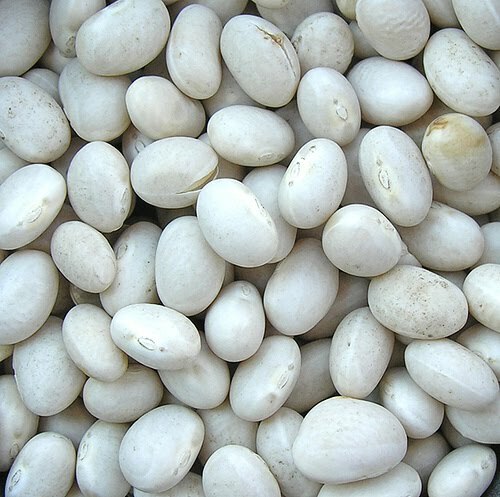 They go well with about any meal and would be excellent with ham for your Easter dinner! Oil a shallow glass baking dish. 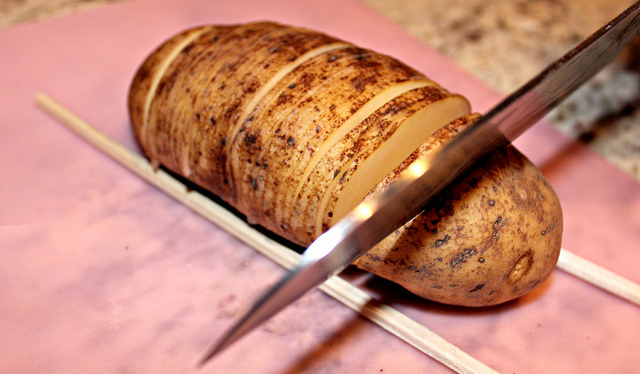 Place on a cutting board and cut a narrow slice from the bottom of each potato, discard the slice. This keeps the potato from rolling. Place a long-handled wooden spoon on each side of the potato lengthwise. Using a sharp knife, slice each potato crosswise ¼” apart, slicing vertically. In a small bowl, place the Parmesan cheese, bread crumbs, 1 tablespoon olive oil, paprika, salt and blend well. Brush the potatoes with the remaining 2 tablespoons of olive oil. Pat bread crumb mixture on top of each potato. Place potatoes in the oiled baking dish. Sprinkle parsley on top, if desired. They look like little “ roly-polys” and taste wonderful! Congratulations, to the new bride and groom! It was a wonderful day, even with the 2” of snow! We all had a fabulous time and have many good memories of it now. 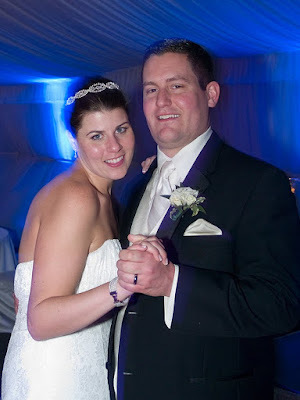 We are so happy for you, Kathy and Matt! We wish you many, many years of love and happiness with a dose of humor and heaps of romance. 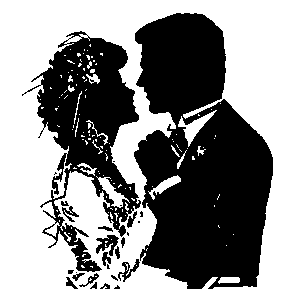 You are truly a couple that is a perfect match for each other! A Wonderful Thing is Happening Tomorrow! And an Award! I am ecstatic and overjoyed!!! I will not be posting for the next couple of days as we have a great event happening in our family, Matt and Kathy are getting married tomorrow! This is the first wedding in our family. They have been going together for 2½ years and I have patiently (Bill probably doesn’t agree) been waiting for this day and am beside myself with excitement now and can hardly contain it. I have never attended a wedding where I didn’t have tears in my eyes when the bride walked down the aisle so I think I should have taken lessons in self-control before this. I will probably fall to pieces when I see beautiful Kathy walk down the aisle and then be sobbing as I turn around toward the altar and see Matt and Bubba standing there! Bubba sent an email this morning about his little speech at the reception when toasting the bride and groom. My eyes were glassy just reading it…. A wonderful, formerly Midwest lady, was gracious enough to give me this lovely Happiness Award. She has a great attitude and tells interesting stories along with gorgeous photos of her life in England now. She makes you feel like you are there! Thank you, Jane @ midwesttomidlands, for thinking of me and sending the award my way! That first cup of freshly brewed coffee in the early morning along with the quiet. The chaos in the kitchen with the family at holiday time and the anticipation of a delicious meal forthcoming. Listening to music or reading a good book, cookbooks included. Playing golf with the league, and others too. Freshly laundered sheets and hopefully ironed also! Sitting on the deck with Bill on a warm summer evening enjoying a cocktail or two. A loaf of home-made bread just out of the oven. A thunderstorm, just as long as it is not severe! I could go on and on but, lucky for you, I will stop here. I hope you all out there are thinking of those things that really make you happy!!! I’m looking forward to reading your lists and seeing what makes you happy! Have a great weekend and…..